Two of the best shot-stoppers outside of the Premier League will be in action at Hillsborough tomorrow. That is the view of former Wolves goalkeeper Matt Murray as Sheffield Wednesday prepare to take on his former club. Keiren Westwood and Carl Ikeme have produced a series of sparkling performances this season, recording 16 Championship clean sheets between them. Murray, now a Sky Sports pundit, told The Star: “They are two quality keepers. “Carl has been sensational for Wolves and Keiren has really kick-started his career again with Wednesday. I watched the Huddersfield game on TV a couple of weeks ago and he was outstanding. Westwood, released by Sunderland at the end of last season, has made 20 starts since penning a two-year contract with the Owls in July. “Keiren’s biggest two attributes are his distribution and shot-stopping,” said Murray, who was forced to retire at the age of 29 after losing his long-running battle against injury. “He kicks it very far and accurately. “Keiren is a very calm shot-stopper. In one v one situations, he comes off his line brilliantly to make himself big and narrow the angle. 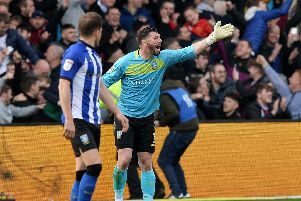 READ MORE: Six great Sheffield Wednesday goalkeepers - how does Keiren Westwood compare? There are growing fears Westwood could be lured away from Wednesday when the transfer window reopens in January. His form has been of the highest standard. Murray said: “Keiren didn’t play enough at Sunderland but he has shown he can stay fit and play regularly at Wednesday. “Because of how good Keiren is with his feet, I think he would be even more suited to the Premier League because it’s more about shot-stopping and distribution at that level. “Keiren will be getting noticed and on people’s radar. He is 30 and coming into his prime. “If Wednesday don’t tie him down on a long deal soon, someone could come in for him but I think Premier League clubs will looking at him and thinking more next year. Murray, a key figure in the Wolves side who beat Sheffield United 3-0 in the Championship play-off final in 2003, knows Stuart Gray from their days together at Molineux. The Wednesday head coach worked as assistant manager under Dave Jones and Glenn Hoddle. The 33-year-old said: “Stu is an excellent coach and was a good foil for Dave Jones, who was more of a manager and standoffish. “The lads loved Stu. People respected him. He is a really funny, nice guy. “When the gaffer gave you a telling off, Stu would maybe tell you in a softer way. He always had the manager’s back but he was a good go between. “Stu’s not a guy who rants and raves. He is a measured, calm bloke who is a good tactician. Five weeks ago, Wolves looked well placed for a top-six challenge. However, a six-match winless run has derailed their momentum. Kenny Jackett’s men will be looking to shore things up at the back when they lock horns with Wednesday, having shipped in 16 goals in their last five outings. Murray, who played 100 times for Wolves, said: “Wolves kept a lot clean sheets and were defensively solid at the start of the season. They played the same back five all the time. Everybody was performing. “Now Kenny [Jackett] is not sure of his best team. The players have been below par and we have not been good enough at both ends.